Lt Col Jim Carr as NC Group 1 Orientation Pilot, April 2008. 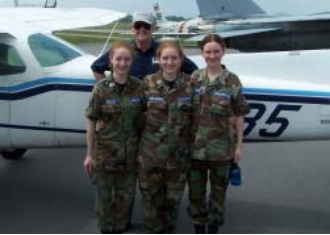 With Cadets Danielle, Elizabeth, and Emily Bullock. NC Wing, Middle East Region, and Civil Air Patrol in general has lost a great member when Lt Col James Carr finished short final for the real Highway to Heaven. Jim was an avid aviator, expert communicator, former CAP cadet, and a true southern gentleman in all respects. I know I speak for many others in the region when I say Jim will be sorely missed on the HF nets and around the hangars. Please include his wife Paula and family in your prayers as we acknowledge a super volunteer who truly spent his life in service to others. I am proud to have known him and very privileged to have had him as a friend. Safe landings and blue skies my friend. Lt Col Jim Carr and I were cadets way back in the 1950’s here in North Carolina. Jim was in Wilmington and I was in the squadron at Winston-Salem. We got to know each other through the various encampments, SAR-CAPS and other activities cadets participated in. He was certainly one of a kind! What a great person to know and kinda grow up with. Of course he is older than I am “but not much”, as he would always say! I can only say that a very special friend and pilot friend of mine has “Flown West” on the “Wings of Angels”. God’s speed my friend. I shall miss you very much. James Ozborn Carr, II (Jim) August 22, 1941 – May 24, 2012 James Ozborn Carr, II (Jim) died May 24, 2012, at Palliative CareCenter & Hospice of Catawba Valley. He was born Aug, 22, 1941, in Wilmington, NC, to James Dickson and Rosalie Watters Carr. He graduated from New Hanover High School in 1959, attended Wilmington College (now the University of North Carolina at Wilmington) for two years, then joined the U.S. Air Force. He was stationed for the most part at Rhein-Main Air Base in Germany. On his discharge in 1966, he returned to Wilmington College in 1967 and graduated in 1968 with a B.A. in business administration. After working briefly for North Carolina National Bank, he became the news director at WHKY TV & TalkRadio in Hickory, working at WHKY in news and in advertising for the rest of his life. He was a member of the Civil Air Patrol from age 15, enjoying training cadets in how to fly, and attaining the rank of Lieutenant Colonel. He was also very active in the Lake Hickory Association for 30 years, helping coordinate the annual Big Sweep clean-up of the Lake. He is survived by his wife, Paula Stockton Carr, his sister, Eugenie Waddell (Genie) Carr of Winston-Salem; his brother- and sister-in-law, Stan and Susan Stockton of Colorado, and their family; and a number of cousins, of whom he was very fond. A memorial service will be held at 11:00 a.m., Saturday, June 2, at The Episcopal Church of the Ascension, 726 First Ave., NW, Hickory, NC. The family will receive friends and family following the service, in the Fellowship Hall. Memorials to Jim may be sent to: The Episcopal Church of the Ascension, 726 First Ave., NW, Hickory, NC 28601; Palliative CareCenter & Hospice of Catawba Valley, 3975 Robinson Road, Newton, NC 28658; and Civil Air Patrol, P.O. Box 1196, Hickory, NC 28603. Bass-Smith Funeral Home in Hickory is serving the family of James Ozborn Carr, II. If you would like to share your stories about Jim Carr, please feel free to add your comments below. Lt Col Carr was Director of Cadet Programs for the Middle East Region when I met him. He coached me through my many roles in the Cadet Advisory Council providing meeting locations and guidance as our regional group met, planned, and pushed forward with our action items. Lt Col Carr’s involvement in my life is what makes me strive so hard to be instrumental in the lives of the children I work with today. When I think of my busy cadet years in Civil Air Patrol almost all of my memories cross paths with both Lt Col Carr and his wife at conferences and events. His life touched so many people and I’m proud to be one of them. I knew Jim for many years. He was instrumental in locating many of the North Carolina Wing Spaatz cadets for our initial meetings. He got endless delight from seeing cadets succeed. He tracked many of their careers, even through their military retirements. He was an avid aerospace enthusiast. He subscribed to many aviation magazines and was constantly looking for unusual aircraft. He was an avid communicator, handling radio duties for many years. He managed the MER Cadet Competition for many years, watching at least two generations of cadets pass through. He made perhaps his greatest impact on the Cadet Advisory Council, frequently having off-site meetings for the MER CAC at his beach house; long before off-sites and retreats were in vogue. He always had a smile or a great story when you saw him. It was usually an airplane or a former cadet story, usually from North Carolina, or England, were he went on IACE. CAP and cadets will miss him greatly.